Tuatara. We saw three of them! I didn't take my 75-300mm zoom (mistake!) which will give you some idea of how close they were. 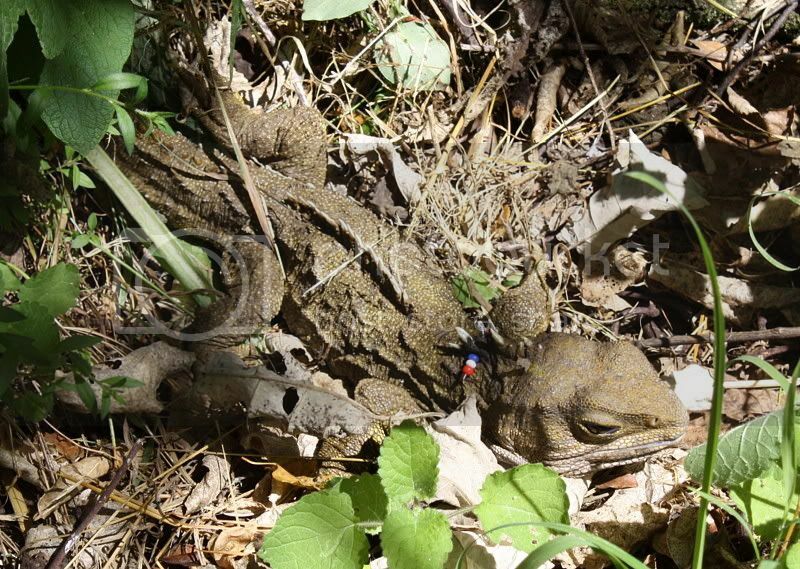 Tuatara were extinct on the mainland until some were reintroduced to the Karori Sanctuary in 2005, where they are doing pretty well, and even having unexpected offspring. They don't tend to move very far during the day, and so the sanctuary volunteers are able to note the positions of ones near the fence on a convenient whiteboard for visitors. The red, white and blue beads on the back of its neck are an id tag. They and their eggs make a tasty snack for various introduced mammals, which is the reason they became extinct in the first place. The sanctuary is surrounded by an effective predator proof fence which keeps out everything but mice, which don't seem to be bothering the tuatara. The volunteer who was showing us around mentioned the possibility that the tuatara may actually be predating the mice, which would be good. oh I love the beads, it makes him look like a bit of a beach bum tuatara!